After a 1-4 start to its season, the Quinnipiac field hockey team may finally have found its stride and are clicking on all cylinders. The Bobcats have won four consecutive games and scored 17 goals in that span, while surrendering only two goals in the process. Led by Danielle Allan’s seven points on a hat trick and assist on three shots, the Bobcats routed Holy Cross, 5-1, on Thursday afternoon at Quinnipiac Turf Complex. 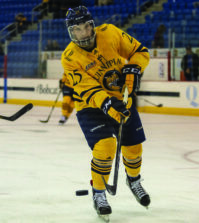 It was also the first hat trick at Quinnipiac since Allan scored three against Sacred Heart on Oct. 28, 2011. Quinnipiac (5-4) also received goals from Jess Rusin and Amanda Danziger. 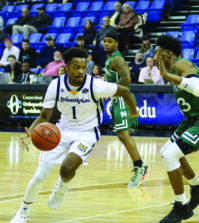 Allan added an assist in the Bobcats’ win to give her a season-high seven points. 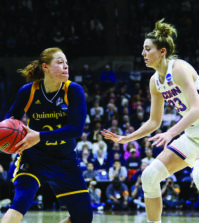 “When you see a whole bunch of things clicking, I was very pleased,” Quinnipiac head coach Becca Main said. Rusin’s goal was her team-leading sixth of the season and 29th of her career. It was also the N.J. native’s 69th career point, tying her with Catie Canetti for second place all-time at Quinnipiac. Jennalise Taylor had an assist, making it four straight games. Kristin Engelke, Kacie McCreesh and Savanna Reilly also had assists for the Bobcats. Reilly’s assist, is her third straight game with a point after she assisted on goals against Vermont and Saint Joseph. Megan Conaboy had held her opponent scoreless in 247:28 consecutive minutes, dating back to the Bobcats 3-1 win against UMass Lowell on Sept. 17. Conaboy’s scoreless streak is a new Bobcat record. Just 6:23 into the game, Allan corralled the ball and dribbled into the circle, where she faked a pass left, and sent a pass to Danziger on the right side of the circle. Danziger then ripped a shot through a crowd of defenders in front, that found the back of the net to give the Bobcats a 1-0 lead. Nearly 10 minutes later, Taylor dribbled into the circle, turned, and fired a shot on goal. The ball was re-directed as Rusin was able to get her stick on the ball and tipped it past Holy Cross’s Maya Langman for a 2-0 lead. Allan scored the first of her three goals less than six minutes later. Engelke collected a loose ball on a rebound off her initial shot on Langman and fired it back on net. Allan tipped the shot past Langman. Allan would one more goal with four minutes left in the half at 31:52. The junior forward’s third goal came in the second half, with the assist credited to Reilly. With 10 minutes left in the second half the Crusaders beat Conaboy to end her Quinnipiac program record scoreless streak at 247:28 dating back to the Bobcats 3-1 win against UMass Lowell on Sept. 17. Molly Feit blasted one of the team’s five total shots past Conaboy to cut the deficit to 5-1. Conaboy recorded just one save, while Langman made eight saves on 13 shots for Holy Cross. 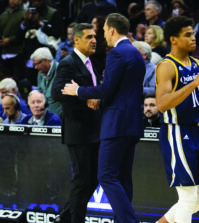 Quinnipiac returns to action on Sunday, when it travels to Norfolk, Va. to play Old Dominion at 1 p.m.